I love taking quizzes and now that Cosmo doesn’t have the same attraction as it once did, (I don’t need a new guy) I do food quizzes and on-line surveys. SparkPeople had a Sugar Craving Quiz and I took it. I passed. I guess the sugar crave morsels don’t rule my life. Now, if it was a salt/fat quiz I would be in deep trouble unless they gave trophies! The Greatest Temptation in my neighbourhood! When I actually look at the foods that drive me insane, even the sweet ones, they all involve fat. Donuts; pastries like cream puffs; whipped cream; chocolate; anything in a pie shell; all these have high fat content. Even ice cream is loaded with fat but tastes so good. I CAN tell the difference between ice cream and frozen yogurt! I think the healthiest “bad” food I crave, that’s also a “sweet”, is carrot cake with cream cheese icing. I make my own and it has lots of carrots, sugar and oil in it. I think that’s why I like muffins better than cupcakes. Muffins usually have more fat in them than cupcakes. In cupcakes all the fat is in the icing! Mmmmm icing. 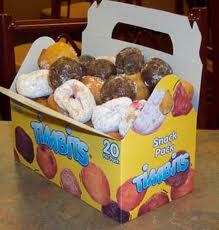 Timbits are a good way for me to deal with the donut cravings. They are a Canadian tradition! Tiny, little morsels of real donutty goodness – jelly filled, old-fashioned, crullers, chocolate, honey-glazed and those little pink ones – yep – they’re all in there. This may develop into a very big problem (big in temptation and big in weight-gaining) because a Tim Horton’s with a drive through just opened in my neighbourhood. I will have to pass it every time I leave the subdivision or come home. Sigh! I should be glad it doesn’t sell french fries, too. Yes, I just shoulded on myself. But, really, I’m not big on the sweets. Candy stays around a long time in my house unless it’s chocolate and the higher the fat content, the faster chocolate goes. I’ve done the sugar cleanse. It was the easiest. The other white foods were harder to get out of my system – white: flours, pasta, rice, potatoes, breads etc. Mind you, if I think about it, all those white things are better with butter or gravy – fat! Enough of that! I’m going to have my breakfast now – a nice one-egg omelette done in the non-stick pan but I will add cheese to fill the fat quota my cute little body (sarcasm) craves right about now after writing about Timbits. ~ by 1fatgirlshrinking - Diane Kirby on April 3, 2012.